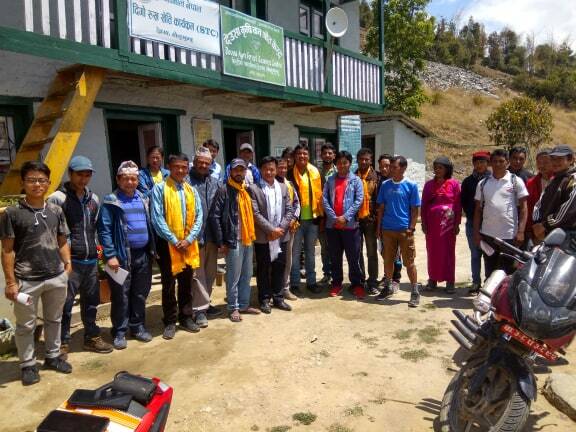 Up in Deusa, Solukhumbu this week, farmers from surrounding villages have come together for a three-day training workshop led by specialists from Everything Organic Nepal (EVON). Deusa Agro-Forestry Resouce Centre (AFRC) is quickly becoming a hub for farmers and community organisers from right across southern Solukhumbu and even into neighbouring Khotang. One of the key elements to the success of the AFRC is its well stocked plant nursery. The agricultural specialists at the AFRC nurture plants from seed and then sell them onto local farmers who transplant them to boost their range of crops. Deusa, however, is a rural location with few roads and very steep slopes. A round trip to the AFRC to buy seedlings or saplings can therefore take a whole day of tough trekking - time that busy farmers can’t really afford. To meet the growing demand for the services of the AFRC, an idea was hatched to establish ‘satellite’ nurseries in strategic locations across Deusa and neighbouring municipalities. TGT funded this work in 2017 and the nurseries are now in operation. The training, led by two experts from EVON, was for the farmers who run the satellite nurseries. It is all part of the lifelong learning and knowledge sharing process that is key to all our work. As the name suggests, farmers learn how to farm organically, with an emphasis on water conservation and climate change adaptation. Our UK Co-Director, Morgan Phillips is one of 30 signatories of a letter to the editor of The Times today. The letter calls for the children and young people participating in today’s Climate Strike to be commended. Image via Alasdair Roxburgh @alroxburgh used with permission. Sir, Children and young people taking part in the school strikes for climate are to be commended, not ridiculed. The UN intergovernmental panel on climate change has said that we need to take decisive action now to avoid the worst effects of climate breakdown. Scorching temperatures, wildfires and floods are already claiming lives around the globe. As more land becomes inhospitable, the refugee crisis will deepen. Young people seem to understand the urgency of this issue, while governments continue to drag their feet. The window for action is rapidly closing, and it is this generation, many not yet old enough to vote, who will have to deal with the consequences of global inaction. People in this country have a proud tradition of standing up for what’s right, so it is fitting that our school children have taken on that mantle on one of the defining issues of our time. We are delighted to welcome Levison Wood – professional explorer, documentary maker, best-selling author and photographer – as our newest ambassador. Nepal will always have a very special place in my heart. It’s been a privilege to explore some of the highest and most challenging terrain on earth, but when you meet the people who live in these fragile environments, it’s a humbling experience. Increasingly the farming communities in remote areas of Nepal are on the front-line of climate change. They are in immediate need of help to adapt to the challenges like crop ruining insect pests that are now being seen at higher and higher altitudes; add to that landslides, drought and the ever-present threat of a glacial lake outburst flood, and you can’t ignore the need to adapt. TGT’s grass roots approach to enabling people in these communities to adapt to climate change and improve their livelihoods is really effective and absolutely essential. I’m looking forward to getting involved. Levison’s appointment comes at an exciting time for TGT. 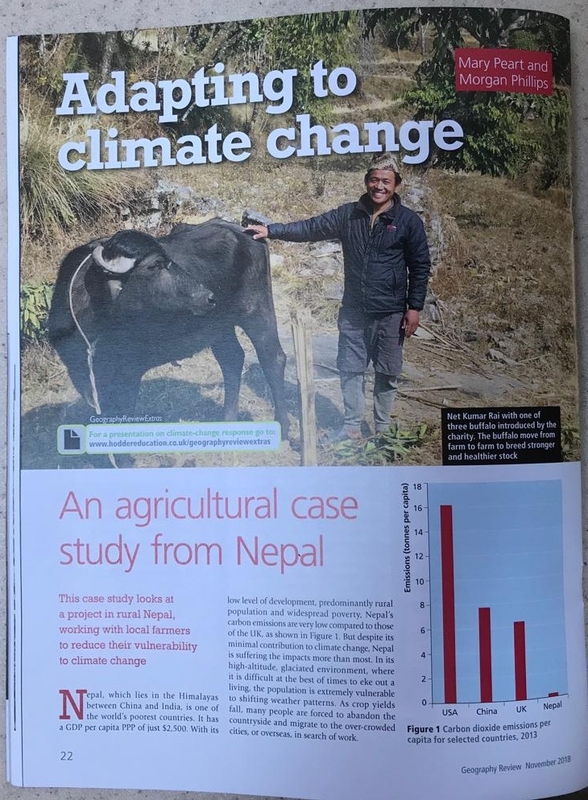 Last week saw the launch of our new report ‘We need to talk about adaptation’ and earlier this year, we extended our work in Nepal with a new project made possible with funding from the Marr Munning Trust. 2019 will also see the formalisation of a three-way partnership between Tribhuvan University (Kathmandu), the University of Southampton and TGT which will enable early career researchers to gain research experience in Nepal’s mountain communities. It is really fantastic to link up with Levison, his incredible adventures are a firm favourite in the Phillips household, we were glued to Walking the Himalayas! Levison’s experience and deep knowledge of Nepal will be a fantastic resource for the charity. We hope to get him involved when his schedule allows and are delighted to welcome him to the trust. There’s an interesting parallel between my expeditions and the need to adapt to climate change. Although we manage risks and avoid danger by planning to the best of our abilities, we must be prepared and equipped to adapt if things go wrong. The same thinking applies for every community faced with the realities of climate change. TGT work in partnership with innovative NGOs in Nepal and together they are helping communities thrive, despite the disruptive forces of climate change. Levison joins acclaimed actor Sian Brooke as a fellow TGT ambassador. The Glacier Trust is committed to raising the awareness of the need to adapt to climate change in Nepal and around the world. The charity’s core costs are covered by three specific grants, which allows it to dedicate 100% of every donation received on climate change adaptation work in Nepal. Late last year we were delighted to receive a grant of £55,658 from The Marr Munning Trust. Over the next three years, we’ll be working with Eco Himal Nepal to establish a brand new Agro Forestry Resource Centre in Mandan Deupur, Kavrepalanchok. We’re very excited to announce the appointment of our newest trustee, Mrs Mary Peart. Last month 12 students and two teachers from the German Swiss International School (Hong Kong) traveled with us to Deusa for their first ‘linking’ visit. It was a wonderful few days. Our partner NGO, EcoHimal, captured these stunning photos. Our work in Deusa, Solukhumbu, has been featured as a case study in the most recent edition of Geography Review magazine. The magazine is subscription only, so we are not able to show you the full content of the article, but the pictures below provide a taste. As soon as we have permission to share the full article we will. 2017/18 was a busy time for TGT and our project partners. We have received their 12-month reports and can now share the results with you. TGT has continued to enable climate change adaptation in Nepal by supporting the work of Deusa Agro Forestry Resource Centre (AFRC) and EcoHimal in Solukhumbu.